The way to succeed in business is to be constantly in touch with your market. The moment you lose touch with them or start making business more about you than your customers is the time you risk becoming irrelevant. While business can get busy, and email can seem like a quicker option, nothing beats picking up the phone and engaging in conversation. Don’t think you have the time? Here are five reasons you should be making the time to call your customers regularly. When it comes to creating raving fans in your business, great service is only the beginning. You need to be intuitive, understanding your customers’ needs, wants and expectations so you can go above and beyond to create a truly ‘wow’ experience. Happy customers will always be your greatest sales people, but how do you get them to the point where they want to tell the world about you? Here are four steps to help you create more raving fans in your business. Like it or loathe it intuition and having a “good feeling” about someone or something can greatly impact our business decisions and the purchase decisions of our customers and potential customers. So how do you ensure you are giving out the right vibe when you are talking to people? Here are five tips to help you give people a “good feeling” about you. If you want to create a real competitive edge in your business start focusing on your customers. It sounds obviously simple, but the fact is most businesses continue to focus on what value they can get as opposed to what value they can give. But when you start to focus on your customers and what they want and need, you create better products and services, generate more business opportunities and sales, develop more loyal customers and increase your referrals. So to ensure you are reaping the benefits and profits of giving value, here are six tips to help you create a more customer-focused business. Credibility is essential for converting contacts into customers. While you may have the better product or service, if you lack credibility, perceived or otherwise, chances are you won't make the sale and your potential customer will go knocking on a competitors door. So how do you build your credibility in the eyes of your potential customers? Contrary to popular belief credibility doesn't start by focusing on your experience and expertise, it starts by meeting your potential customer where they are, identifying what they need and want, then easing their frustration by solving their problems. To help you here are five ways you can establish credibility with your potential customers before you start talking about yourself. Whether we like it or not people make assumptions about us, our business and even how we conduct our business based on the industry we are in. Don't believe me? What is the first thing that comes to mind when you think of a used car salesmen, lawyer or journalist? When you call a tradesman are you expecting them to be on time or late? Tidy or messy? What about when you meet with an accountant? Are you expecting a passionate, engaging person or a person who has less personality than their calculator? While some people certainly do fit their industry stereotypes, many of us don't. But as frustrating as it can be to be judged according to a perception, idea or bad experience someone else is responsible for, it can provide you with a very clear way to differentiate yourself and a very powerful method to sell. To show you here are four tips to help you turn your industry stereotype into powerful points of difference. While mistakes in business can fill us with dread and embarrassment, like many other times of trial and adversity they can be turned into an opportunity to showcase the professionalism integrity and authenticity of our business. So how do you recover with your reputation in tact after you've dropped the ball? Here are three tips to help you turn a mistake into a marketing opportunity and win the respect of your customers and business associates. One of the fastest ways to make more sales is to get your existing customer base spending more with you. Having already seen the value and results in doing business with you, your existing customers are not only easier to convert, but also don’t require you to outlay any money in order to reach them. So how do you keep your customers coming back and spending again and again? 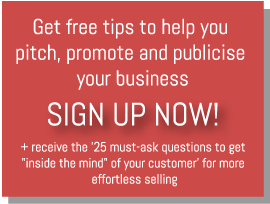 By finding ways to resell, upsell and cross-sell your products and services. When you're working late nights and early mornings, constantly pushing yourself to work harder, increase your clients, grow your business and meet deadlines, you can end up tired, stressed, overwhelmed, late with your work and can even lose the passion you had for your business to begin with. So how do you maintain your health and sanity and your clients happiness during busy times? Here are six tips to help you avoid burnout and burning clients. You saying you're great is one thing, but a customer saying you're great? That can really help to get sales over the line. Testimonials and case studies can be incredibly powerful. Not only do they give your potential customers an example of how you could help them, the customer giving the testimonial is doing the sales pitch for you, and chances are what they loved about you will be what potential customers are looking for. So how do you get more testimonials and make the most out of the testimonials your customers give you? Here are four tips to help you get testimonials that will convert sales for you. Repeat customer sales are the cheapest and easiest business you will ever generate, so it makes sense that more of your time should be spent nurturing and leveraging your existing customer relationships than bringing in new business. But how do you keep customers coming back and buying again and again? Here are eight tips to help you turn those once off buyers into loyal, profitable, repeat customers.